Go to the left navigation pane, and choose Cost > AWS Partner Tools > Configure > Account Families. The Account Families page opens. Click the account family name to expand the section and see the account family details. Additional options are now displayed. 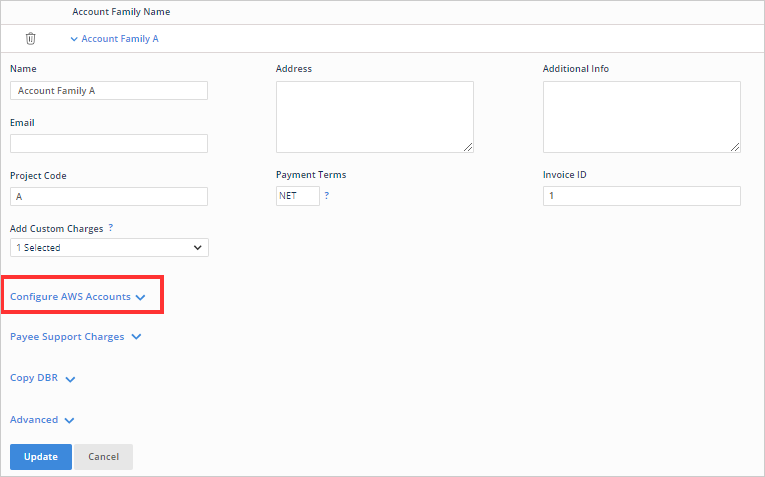 If you selected the Create a Multi-Account View to mirror this Account Family check box in the Create Customer dialog box, that selection is reflected in this section. This section also shows any AWS accounts that are already tied the account family. In this example, Account A is mapped to the account family. Click Remove to remove an account from the account family. Click Add account to this Family if you want to add an additional AWS account to this account family. The Add Accounts dialog box opens. 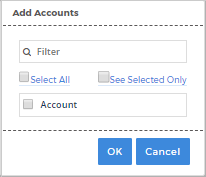 In this dialog box, you can type a keyword in the Filter text field to search for accounts that meet your search criteria, click Select All to select all accounts in the list, or click Selected Only to see only the filtered results. When you are done making changes, click Update.